Welcome all to a actual Episode of Indeed Podcast - sort of. With new format changes and setup. We will complete shows in a shorter format more focused on topics. Roundtables - Interviews - Creepy or Cool - Game focused. We hope they can provide faster content as we ramp up for summer. Tonight's round Table brings Keefe, Kerry and Chris together to look at three new topics. The First is about a study done in America says that even teens admit that they are addicted to their cell phones. Second we talk about a finnish boy who was able to point out a software flaw and win 10k in reward money. Last we follwup on the lawsuit on Anaxar where a American Language Society wants to argue that the Klingon Language can not be copy-written. These brings discussion and incite for us that even when setting a time limit, Kerry finds a way to write a book. 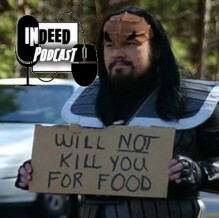 Thanks all who listen and keep us going, remember to email us with questions or comments at indeedpodcast@gmail.com or find us on Facebook, itunes. Check out CLOUD SOURCED by Keefe. Hit the big 200. Book one Complete. Versus the World Productions is a network of independent Shoutcasters, Podcasters, and Bloggers dedicated to all things gaming, technology, and all-around geek culture. We provide a variety of content on a weekly basis, and our Shoutcast stream runs 24 hours per day, 7 days per week. We offer inexpensive podcasting solutions for individuals who want to create original content as well as hosting both audio and video feeds of some of the most unique content on the web. VTW Productions. Simple theme. Powered by Blogger.